Get ready for some good ol’ fun down on the funny farm! 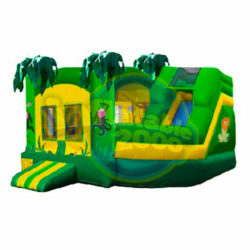 Your party guests will go hog wild for the fun Western barnyard-themed Funny Farm inflatable bounce house. Get ready for some good ol’ fun down on the funny farm! Your party guests will go hog wild for the fun Western barnyard-themed Funny Farm inflatable bounce house. This cheerful and bright bounce house features a rooster and a country picket fence. Party guests bounce in the big red barn with all the friendly farm animals. In addition to all of these fun features, this bounce house was designed with safety and durability in mind and constructed with only the highest quality 15 oz. “lead free” materials. Yee-haw!